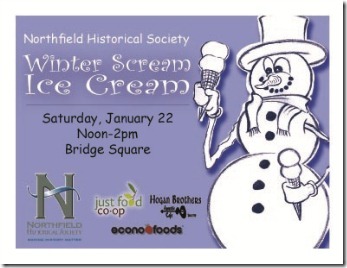 Although it sounds a bit Nordic Pagan (“a communal sing designed to force the weather gods to release us from their cold winter grip”), I’m sure that Jews, Christians, Muslims, and even Atheists are all invited: the Northfield Historical Society’s Winter Scream, Saturday in Bridge Square. So come on down(town) and sing (and eat) the winter away! Friday, January 21st: One Act Plays, 7:30 p.m., High School Auditorium, Kiss Me Weirdly, 8 p.m., Northfield Arts Guild Theater; Jim Lenway, 8 to 11 p.m., Contented Cow; Sweet Jazz, 8 to 11 p.m., Tavern Lounge; and Driven, 9 p.m. to 12 a.m., Grand Event Center. Saturday, January 22nd: Winter Scream, 12 to 2 p.m., Bridge Square; One Act Plays, 7:30 p.m., Northfield High School; Kiss Me Weirdly, 8 p.m., Northfield Arts Guild Theater; Derek, 8 to 11 p.m., Tavern Lounge; and King Cool, 8 to 11 p.m., Contented Cow. Sunday, January 23rd: Faculty Recital: Cello and Piano, 3 to 4:30 p.m., Concert Hall on the Carleton College campus; Politics and a Pint, 6 p.m., Northern Roots Session, 7:30 p.m., and Quiz Night, 8 p.m., all at the Contented Cow. Breaking News: Tonight – Friday January 21, dance away the winter chill at the Northfield Arts Guild’s Friday Night Dance Party. Doors open at 7:30 p.m.; Zumbra dance starter at 8 p.m. A donation will be requested to support the NAG scholarship fund.